They were necessary for two reasons. First was as a last resort. When every single plate in the house was dirty and piled in the sink, it was nice to have something to eat off of. Second was as a first resort. 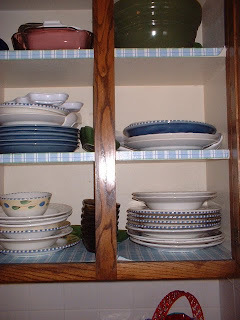 Last summer we ate off of paper plates for almost every meal in order to avoid the sink pile-up. Thankfully, with coupons I was generally able to get very cheap paper plates, although never free. But now I’ve figured out how to not spend a cent on paper plates. Seriously, not a cent. Are you ready for my big revelation? 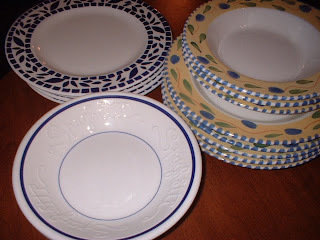 Since I started this blog last August, I haven’t bought paper plates other than for a Christmas party, and then it was mostly because they were so pretty. AND those paper plates lasted through a second party. I didn’t realize for quite a while that we hadn’t used any. Then a sale came along, and it hit me that we didn’t need them. When I start the dishwasher every night and empty it the next day, we always have clean plates. I know this is a “duh” concept for the majority of the population, but it was an experiential revelation for me. Even when I miss a day, we’re still okay. Even having home groups at our house on Sunday nights, we have plenty of “real” plates. 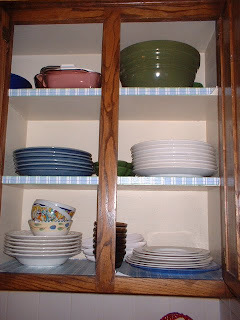 So along those lines, I decluttered the cabinet where I keep everyday-dishes today. This was a rather emotional experience. I love dishes. When my husband and I registered for wedding gifts, I was only home from Thailand for 2 weeks, so I didn’t have much time for pondering. I basically scanned every set of dishes that caught my fancy. And since we were both older than most of our friends when we married, people were very excited for us and we pretty much got every single thing we registered for. So I have a lot of dishes. Here is the cabinet before, with no rhyme or reason for how things are put in there, a prime candidate for my “A Place for Everything” resolution. Keep in mind that this view is minus three meals worth of dishes for yesterday and the dishes from breakfast today. Here are all of the dishes laid out on the table. What appears to be “a plate” is actually a stack of plates. I love them all, but they are no longer complete sets, so I chose to go with the white ones that I have plenty of. And I’m also keeping the white melamine plates. With just the white ones, I have plenty for when we have guests over. Here’s the finished cabinet. Notice how there’s a place for everything? When I first read this, I thought you washed the paper plates! haha We have started doing this too, lots less wasteful!! When I was in high school, the parents of two boys went on some trip and left them in the house alone together – yep, two teenage boys on their own for a week! One of htem was telling me that their parents were coming back the next day so they thought they might do the dishes that night since (a) nothing was clean and (b) the sink smelled. I was horrified at the time, but totally understand now! I've done the dishes every night except for three of them since Christmas. I'm inordinately proud of myself! It's also a lot easier to cook when you don't have to clean first! I'm only smiling because I need to discover about three dozen of these revelations myself. But you can't find them until they present themselves, and they don't present themselves unless you look for them. I need to get busy… Nice work!! Out of curiosity, what do you use when you are micro-waving leftovers? My mother (who hears of every study, news story, etc. exposing the dangers of anything,) is convinced that using anything other than paper plates or clear glass, microwave safe containers will expose us to BPA, lead and a host of other toxins. We keep the paper plates on hand for use in the microwave only. Mostly because I use the microwave a lot at lunch and would hate to keep washing my glass containers. I use glass plates, but not necessarily clear glass ones. I hadn’t heard that . . . I stopped microwaving in plastic quite a few years ago. I never used to use paper, but we moved and are now renting. We do not have a dishwasher. So, I use paper for icky things like greasy pizza, etc. just easier clean up for me! 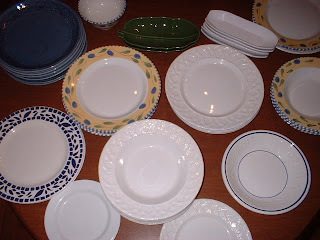 I still use too many paper plates – in an effort to avoid dirtying dishes. I do them by hand because I figure if I’m going to wash them anyway before putting them in the dishwasher, I might as well rinse them and put them in the dish drainer. Given that most of my pans won’t fit on the racks, meaning I have to run dishwater anyway, it works. I wash, my son dries…and everything is put away before bedtime. Yep! 25! Isn’t it such a matter of perspective? “All” my childhood friends had been married for several years before that. I agree that 25 is plenty young! I am proud to say that my dishes and sink are now clean nearly every single day. It’s not a perfect system, I do the dishes in the afternoon and then we cook dinner not long after. This means the kitchen is clean for cooking, it’s just not clean for breakfast and lunch. But it is sooo much better then it was before I took your advice to the dishes; every. single. day. I resisted and resisted at first, but I pushed through. Now it feels so much easier, I don’t feel as resentful and I’ve surprised myself several times doing them much later on those days when I’m sure I’m just going to skip them because the daily routine is all out of whack. I find myself doing them because I don’t want to be doing them the next day when dishes math comes into effect and it takes 3 times as long. Because we don’t have children I can also give myself a day off from dishes once a week. Friday afternoons I wash the dishes and we have takeout, it’s my night off from cooking. This means I can take Saturday afternoon off from dishes (our most crazy day for not having a routine). We don’t have a dishwasher. Thank you Dana. A clean kitchen makes so much difference! I LOVE this comment, Stella!!! So much that I’m going to have my assistant turn it into a mailbox post!!! Thank you so much for sharing my comment with your readers, I am so excited! You know that story you tell about the bug man coming over? I experienced the online version of that this morning. Ha!! I hope that means you got some traffic!! My little blog has never been so busy. Thanks again Dana!